Around 32 children drown every day in Vietnam, according to statistics from SwimSafe. Many people in the country lack the skills needed to stay safe in deep waters. To combat what has been dubbed a public health emergency, United Nations International School (UNIS) of Hanoi, in Vietnam, created service learning programme Swim for Life in 2006, in collaboration with the country’s Ministry of Education and Training. 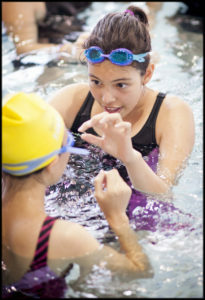 Every week, adult instructors, and UNIS Hanoi IB Diploma Programme (DP) and Middle Years Programme (MYP) students, teach a diverse group of people how to swim, including homeless teenagers, children with disabilities and elementary students. Each academic year, Swim for Life attracts 16 student volunteers, mainly from the school’s swim team, who teach up to 100 children over nine months. The learners are either referred from the school’s charity partners, or from the local elementary school. Other students have gone on to achieve the internationally recognized American Red Cross Water Safety Instructor’s certificate, which is now offered via UNIS Hanoi, thanks to a grant from the school’s ‘Birthday gift fund’. DP student Yoon­Ju Gee says gaining the certificate has already led to great opportunities. She now has a paid, part­-time, after­school role on the school’s Aquatics Academy team, and offers weekly lessons to local kindergarten children. Aquatics Director Ella Healy says the programme has become so successful because UNIS Hanoi students are at the forefront of teaching. “I really try to stay in the background; I want to empower our students to lead and direct the programme,” she adds.